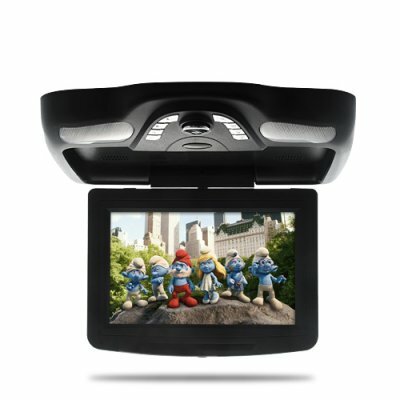 Successfully Added 10.2 Inch Roof-Mounted Car DVD Player with IR Headphones - Flip Down LCD Monitor (Black) to your Shopping Cart. Transform your car, minivan, or SUV into a moving movie theater with this 10.2 inch overhead flip down monitor and car DVD player unit. It's an ergonomic, feature-packed, and easy to install car audio and video player that will bring both driver and passenger hours and hours of entertainment delight. Why go with an overhead flip down monitor style car DVD player and not a regular in-dash car DVD player? It's all about the angle and style. With an in-dash car DVD player you're looking down at the screen and for some people this can be tiring. With an overhead monitor, you can lean your head back against your plush and comfortable headrest. Easier on the neck. What's more, overhead flip down monitor car DVD players also make it easier for the passengers in the back (kids, coworkers, friends) to see what's playing! Simply remove the 4 screws at the bottom of the unit to detach the metal support bracket. Tighten the metal support bracket to the roof of your car. Attach the unit back onto the metal support bracket. That's it! Easy peasy one two threesy! Do that and you're set for a boredom busting good time whether you're on the way to grandma's house or waiting for the kids to finish their soccer game! It also come with free IR headphones. Whether you're listening to music or watching movies, using this wireless headphones can enhance your personal listening pleasure. This cordless technology means that you no longer have to be restrained to one position to listen to your audio system. By eliminating the need to use wires to transmit audio information to your head phone, the headphones allow you free movement and a free lifestyle. Amazing. This roof mounted car DVD player is so feature-packed that it will open you to an exciting new world of in-car entertainment and also raise the resale value on your automobile should you decide to sell it. The DVD player itself is region-free so you can play any disk on it whatsoever. It comes with a SD card or USB flash drive media player which plays all the most popular audio and video media formats like: MP3, DAT, MPEG1, MPEG2, MPEG4 (MP4), XVID, DIVX, and AVI. 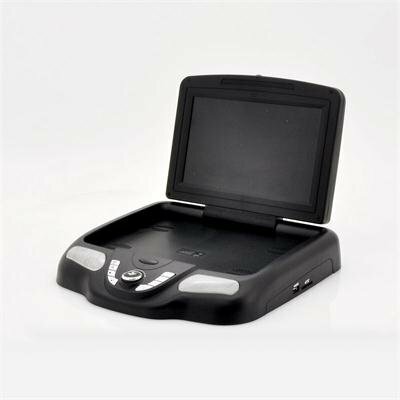 For sound, this car DVD player uses an FM transmitter to convey audio to your car speakers. This takes the hassle out of running speaker wires. All you do is set the car DVD player to transmit at 88.1 MHz for example. Then you turn on your FM radio and tune it to 88.1 FM. Voila! The sound from your DVD automatically comes out your car's sound system! Press add to cart now and in a few days you'll be the proud owner of a bonafide roof mounted entertainment center on wheels for half the price of an in-dash car DVD player. Brought to you by the online leaders in direct from factory car DVD players - Chinavasion.